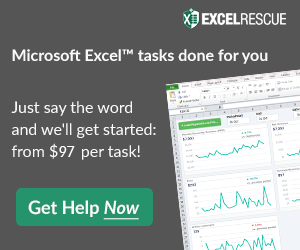 Here is a Friday Challenge that a lot of Excel users may run into. Essentially, you are given a date and incident type that occurred on that date. 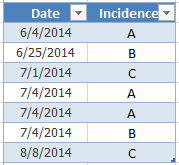 However, the user wants to take those columns of data and create a chart of cumulative incidents by date. 1) Copy the starting data from the table above to your Excel Worksheet and then create a Chart Data Range for the Cumulative Incidents by Date. 2) Create a Formula that can be used to to Easily create the cumulative values for new dates and new incidence types that may come our way. 3) Create a Chart that Best presents a) what the user wants and b) the chart data. Good luck and send me a Contact Form request below if you want to share your success! How to create a mid function for middle name from the full name?? This will extract the middle name (only the first middle name if there are more than one) based on having a space between first, middle, and last names. If there is no middle name, based on spaces between names, it will return “No Middle Name”.